The International Criminal Court’s chief prosecutor says Muammar Gaddafi’s son Saif al-Islam may be trying to flee Libya with help from mercenaries. 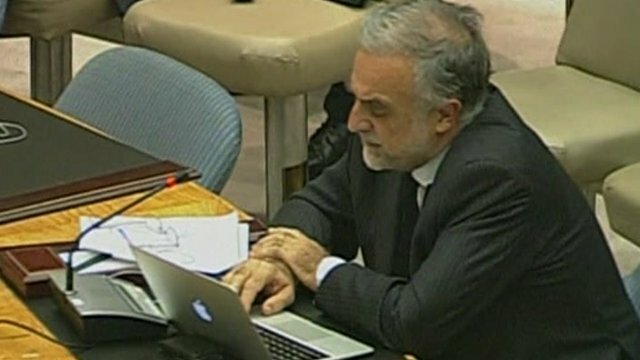 In a statement to the UN Security Council, Luis Moreno-Ocampo called on other countries to disrupt such plans. The court has been trying to negotiate the surrender of the 39-year-old, who is wanted for war crimes. Mr Ocampo also said they were examining allegations against Nato and interim forces, as well as pro-Gaddafi troops. He said they would examine alleged crimes by all sides “impartially and independently”. Saif al-Islam, who was once the presumed successor to the former Libyan leader, has been in hiding for months. The ICC have been holding talks with intermediaries to secure his arrest, following the death of his father on 20 October. Mr Ocampo said he was also investigating evidence about mass rapes committed by pro-Gaddafi forces, as well as allegations about war crimes committed by the former rebels and Nato forces. Allegations against National Transitional Council (NTC) troops include the arbitrary detention of alleged mercenaries and the killing of detained combatants, Mr Ocampo said. He did not specify the claims against Nato, which carried out an air campaign under a UN mandate to protect civilians. Reports from last month claimed Saif al-Islam was in a convoy heading toward Libya’s desert border with Niger, where other Gaddafi allies have fled – but the reports were never confirmed. An ICC arrest warrant issued for Saif al-Islam in June accuses him of murder and persecution. The document claims that he played an essential part in systematic attacks on civilians in various Libyan cities carried out by Gaddafi’s security forces in February. Gaddafi’s former intelligence chief Abdullah al-Senussi is also wanted by the court. The National Transitional Council (NTC) has said it would like to try the two men in Libya. NTC forces overthrew Gaddafi in late August, and are now overseeing a political transition intended to lead to national elections within eight months.